Watford Live! Oral History Project. Interviewees memories of WW2 in Watford. 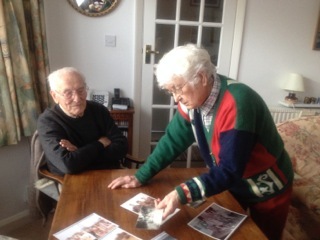 Mrs Sylvia Coles looking through her photographs with her husband. A selection of clips on the theme of WW2 in Watford. I remember when Watford received a V2 rocket attack.I lived in Croxley but we heard the explosion 3 miles away, 4 of us cycled into an area near to Princes Street where a V2 had landed on the middle of a 5 house terrace.It was all ablaze still when we arrived and afterwards we went up the road to Grillos ice cream shop for a cornet. !